A small city founded in 1693 and located in the state of Nuevo Leon, in northeastern Mexico, near the border between Mexico and Texas. The city was founded around a spring, which is still a part of several parks and tourist attractions within the city. It is named after the revolutionary war hero, Padre Miguel Hidalgo, who issued the Grito de Dolores (Cry of Dolores in English) on September 16, 1810 that urged the people of Mexico to join in a rebellion against the corrupt condition of Spanish politics in the then colonial outpost of Mexico. The city is referenced very briefly in Tony Hillerman's 1982 novel The Dark Wind as the starting place of a drug smuggling plot line involving a pilot from Chihuahua, Mexico. The drug trade between the U.S. and Mexico especially impacts the border states of both countries, which see the most conflict and violence. 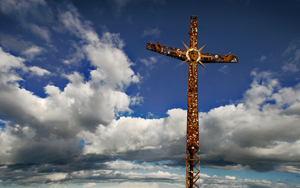 "Cross overlooking town of Sabinas Hidalog, Nuevo Leon, Mexico, September 17, 2007" by Omar Diaz is licensed under CC BY. N.d. Historia. Http://www.sabinashidalgo.net/historia, accessed March 25, 2015. 2015 Sabinas Hidalgo, Nuevo Leon. Http://sussle.org/t/Sabinas_Hidalgo,_Nuevo_Le%C3%B3n, accessed March 25, 2015.